This page has limited information. 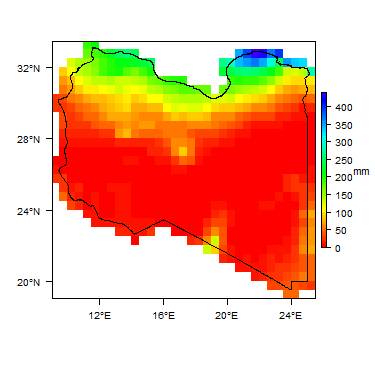 If you have more information on the hydrogeology of Libya, we will be happy to include it. Libya has been inhabited since ancient times and seen successive occupations, including Romans, Arabs, the Ottoman Empire, Italy and post-second world war Allied forces. Libya became independent in 1951, initially as a kingdom but following a military coup in 1969, ruled by Muammar Gaddafi until he was overthrown in a civil war in 2011. Widespread military, political and civil unrest has continued since 2011. In September 2017 the UN announced a new roadmap for political reconciliation, calling for a constitutional referendum and new general elections within a year. The Libyan economy depends on oil, which was discovered in 1959. Other natural resources are natural gas and gypsum. There is a very large public sector, and the government is the largest employer in the country. Agriculture, which before oil discovery was the main source of revenue, today accounts for a very small proportion of GDP, and Libya imports large proportions of its food. In the early 1980s, Libya was one of the wealthiest countries in the world, but unrest in recent years, exacerbated by falling global petroleum prices, have had a significant impact on infrastructure and the economy. Most of Libya is desert, with limited surface water resources, and it relies almost entirely on groundwater, most of which is ‘fossil’ water – recharged thousands of years ago when the region’s climate was wetter. Most agriculture relies on groundwater for irrigation, largely from the Great Man Made River. This was a major project from the 1980s: a network of pipes transporting groundwater abstracted from the Nubian Sandstone Aquifer System, in the Saharan part of southern Libya, northwards to cities and towns on the coast where most of the population lives. Libya. Map developed from USGS GTOPOPO30; GADM global administrative areas; and UN Revision of World Urbanization Prospects. For more information on the map development and datasets see the geography resource page. 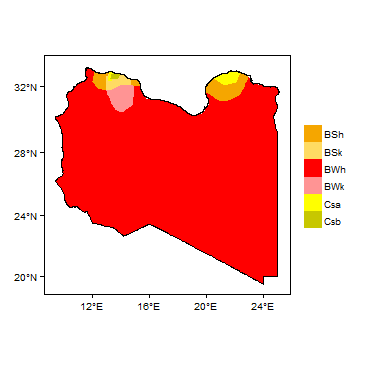 More information on average rainfall and temperature for each of the climate zones in Libya can be seen at the Libya climate page. There are no permanent rivers in Libya, only ephemeral rivers or wadis. There are several natural desert lakes, which support unique ecosystems and provide a water supply to desert nomads and migrating animals (Abufayed et al. 2015). The main lakes are the Ubari lakes in the Ubari Sand Sea in the south, including the Gaberoun, Mandara and Mafo akes–, the protected Ouau en Namu lakes and the 23rd of July or Benghazi lake, which is more properly a lagoon. The Qattara Depression in the north-west of Libya lies under the sea level and is covered with temporary lakes, salt pans and salt marshes. Other large salt pans include Sabkhat al Hayshah close to the coast near the gulf of Sidra, and Sabkhat Shunayn and Ghuzayyil in the north-east. 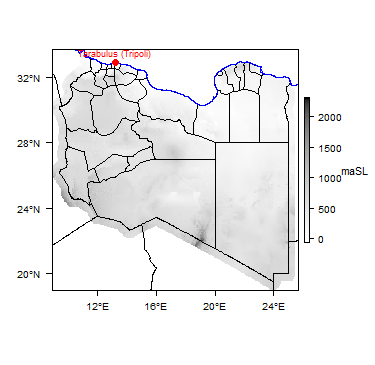 Major surface water features of Libya. Map developed from World Wildlife Fund HydroSHEDS; Digital Chart of the World drainage; and FAO Inland Water Bodies. For more information on the map development and datasets see the surface water resource page. 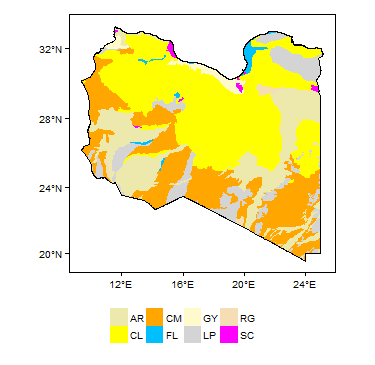 Soil Map of Libya, from the European Commission Joint Research Centre: European Soil Portal. For more information on the map see the soil resource page. 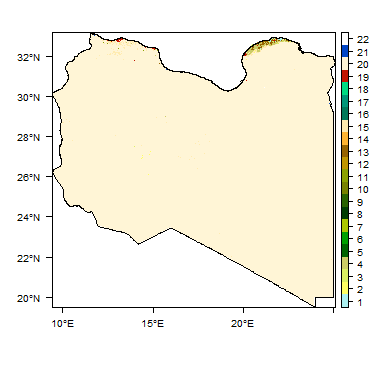 Land Cover Map of Libya, from the European Space Agency GlobCover 2.3, 2009. For more information on the map see the land cover resource page. Geology of Libya at 1:5 million scale. Developed from USGS map (Persits et al. 2002). For more information on the map development and datasets see the geology resource page. The hydrogeology map below, at 1:5 million scale, shows the type and productivity of the main aquifers at a national scale (see the Hydrogeology map resource page for more details). More information on the hydrogeology of Libya is available in the report United Nations (1988) (see References section, below). 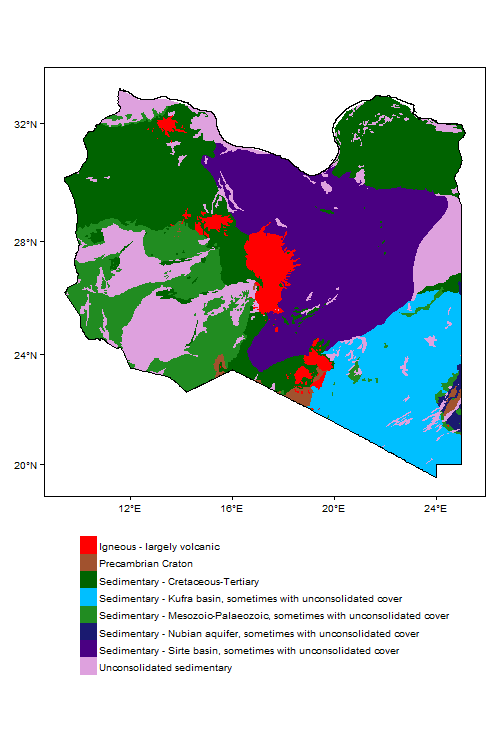 References with more information on the geology and hydrogeology of Libya can be accessed through the Africa Groundwater Literature Archive. Abdudayem A and Scott AHS. 2014. Water infrastructure in Libya and the water situation in agriculture in the Jefara region of Libya. African Journal of Economic and Sustainable Development, 3 (1). Abdelrhem IM, Raschid K and Ismail A. 2008. Integrated groundwater management for Great Man-Made River Project in Libya. Eur. J. Sci. Res, 22, 562-569. Aqeil H, Tindall J and Moran E. 2012. Water security and interconnected challenges in Libya. Tinmore Institute Research Report WS121027. Abufayed A, Madi L and Radi M. 2015. Libya State of the Water Reporting, Monitoring and Evaluation Operational Framework and Guidelines. Report for CEDARE. Alfarrah N, Berhane G, Hweesh A and Walraevens K. 2017. Sinkholes Due to Groundwater Withdrawal in Tazerbo Wellfield, SE Libya. Groundwater. Dolezal RC. 2016. The Nubian Sandstone Aquifer Dispute. Pangaea Journal. Russeau S. 2011. Libya: water emerges as hidden weapon. Fri 27 May 2011, for IPS. Sattar AMA and Gawad SA. 2014. North Africa Regional Water Sector M&E Rapid Assessment Report. Report for CEDARE. Stephan RM. 2013. Adoption of Regional Strategic Action Plan on the Nubian Sandstone Aquifer. Post on the International Water Law Project Blog. United Nations. 1988. 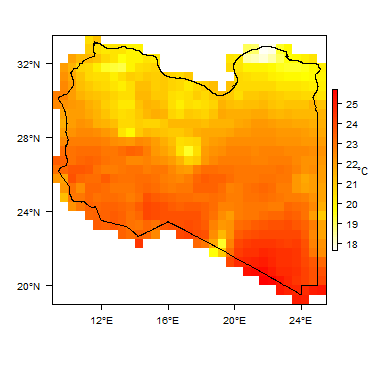 Libya: Groundwater in North and West Africa. United Nations Department of Technical Cooperation for Development and Economic Commission for Africa. This page was last modified on 18 February 2019, at 10:08.